The July 18 friendly between Athletic Club de Bilbao and Club Tijuana in Boise, Idaho was an imagined thing, drawn up years ago on a cocktail napkin by a few people over drinks, stuck in a pocket and forgotten, resurrected and revised, and finally brought to life by hundreds of meetings and phone calls like most big ideas have to be in order to see the light of day. It’s a professional soccer game in a college football town played in a U.S. stadium by two non-U.S. teams who have never faced each other and might never face each other again. It was practically impossible. Just to make the game happen in the first place, the organizers had to have 85,000 square feet of Kentucky bluegrass trucked in and placed over plastic decking and two layers of tarp to cover the actual surface, which is artificial turf colored blue and trademarked so no other university can copy it. When the game is over, all that grass will be rolled up, shipped away, planted in a park, and it will be as if the friendly never happened. The original cocktail napkin plan didn’t envision all that. The only idea then was to bring Athletic Club to Boise for a game during Jaialdi, the massive international festival held every five years by Idaho’s Basque community. 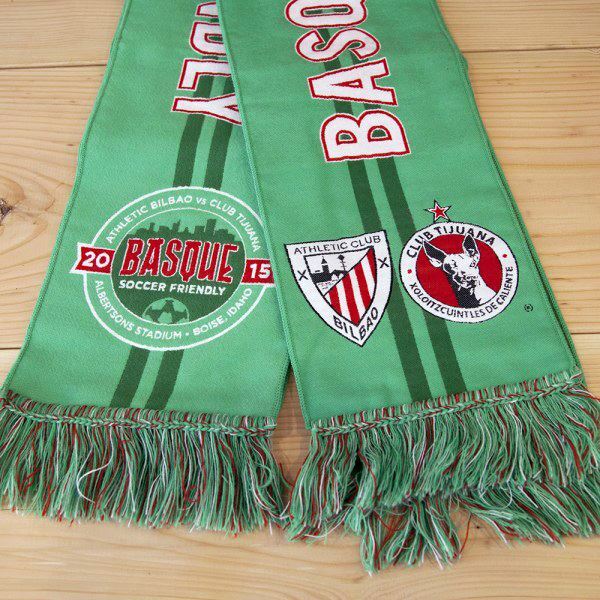 Athletic is an iconic team, founded in the 1890s in Bilbao, the Basque Country’s largest city. It’s ranked among the top 30 soccer teams in the world. Athletic plays in a brand new 53,000-seat San Mamés stadium constructed on the same site as the original San Mamés built in 1913, and is now one of the premier soccer venues in Europe. They’ve been champions of La Liga, Spain’s top professional division, eight times, and winners of Spain’s most prestigious cup competition, the Copa del Rey, 23 times, the most of any team besides FC Barcelona. It’s not the only contrast about the game. The unusual turn of events that brought these two teams together created another pairing that wasn’t anticipated: A matchup of two of the most significant immigrant groups in the American West, whose experiences over more than a century in Idaho tell different stories about where they came from and where they live now. For Athletic Club, the friendly is as close to a home game as they could get 5,155 miles from San Mamés stadium, since they’ll be supported by many descendants of Basques who made the same trip decades earlier. (As an example and a disclosure, I have roots in the town of Lezama, the location of Athletic’s training facility.) Basques first went to Idaho in the late 1800s and thousands followed over the years, most as itinerant sheep herders, a job few Americans were willing to do — “rock bottom,” as one historian wrote. They didn’t do it because they loved it. Many were coming from a hand-to-mouth existence. About half who went to Idaho couldn’t read or write. If their family owned property, it was generally passed to the oldest child, and the choices for the others were limited: stay at home, work for the older sibling and stay celibate for life; join the seminary or convent; or work for low pay in one of the suffocating plants in Bilbao. That was about it. In that context, it wasn’t so farfetched to move to the other side of the Earth and work alone with 2,000 sheep, especially since they could earn as much in a few years as they could in a lifetime back home. That view dissipated once Basque immigrants ended up staying and marrying (although often to other Basques). The same Caldwell newspaper wrote in the 1930s that the U.S. was “the land of [Basques’] adoption, and they make good citizens.” Idaho tourism brochures began to feature photos of Basque dancers. And even though large-scale Basque immigration has stopped, the Basques’ sense of identity has continued, actually multiplied as spouses and children have been brought into the mix. One second-generation Basque said that “when you know somebody is Basque, you just have a different relationship with them. You have something in common by virtue of your blood. It really doesn’t matter if that’s the only thing you share.” It’s part of the reason Athletic is wearing their home uniforms at the friendly. For Tijuana, the friendly also might be as close to a home game as they could get 1,000 miles from Estadio Caliente. Mexicans are by far the largest ethnic group in the state: About one of every ten Idahoans is Mexican or of Mexican descent. Like Basques, Mexicans entered Idaho before it became a state in 1890 and, like Basques, they made a significant impact in specific industries, principally with railroads and agriculture. But around the 1960s, at a point when Basque immigration into the state had essentially ended, Mexican immigration took off. Between 1980 and 2010, the Hispanic community (which is about 85 percent Mexican) grew by almost five times in Idaho. The 2010 U.S. census recorded about 149,000 Mexicans in the state, 9.5 percent of Idaho’s total population. Like Basques, Mexican immigrants took jobs that nobody wanted. That included tens of thousands of migrant workers, who did it because they had no choice: “It was migrate or starve,” according to Dr. Errol Jones, a professor emeritus at Boise State University who has studied and written extensively about Mexican immigration. Migrants have been “essential to Idaho’s prosperity,” he wrote. “Migrants came with their own transportation, were skilled and experienced agricultural workers, worked for low wages, demanded little of the state’s social services, and generally vanished when the work was done.” The industry valued Mexicans enough to lobby for special “guest worker” status for tens of thousands to enter the state, even in the first part of the 20th century when U.S. policy limited southern and eastern European immigration, and prohibited Japanese and Chinese immigration altogether. That didn’t mean Mexicans were welcomed by all Idahoans. Saloons and shops in Canyon County and elsewhere barred them for many years. Into the late 1950s, signs posted outside some stores in the Treasure Valley warned “Mexicans, Negroes, Jews, Indians and dogs” to stay out. The Mexican immigrant experience in Idaho has reflected their position of being both valued and disfavored at the same time, a clash between a need for labor and a resistance to change — and in some cases, outright prejudice. While they were essential to Idaho’s agricultural industry, Dr. Jones wrote, Mexican migrants were “almost invisible.” They drank water from open pools contaminated by pesticides sprayed on the crops they were working. On Sundays, after he plays soccer, Father Camacho goes back to Saint Mary’s to say a Mass in Spanish usually attended by more than 1,000 people. Some drive for an hour to be there. He estimates that the parish is about 40 percent Hispanic, most of which are Mexican. It’s a sample of their larger presence in the state, which has an Hispanic Chamber of Commerce, an Hispanic Cultural Center, countless fiestas, quinceañeras, dance groups, and other traditions and associations that will determine what the Mexican community and Idaho become over the next decades. Some of that community will be at the soccer game to cheer on Club Tijuana against Athletic Club de Bilbao, who has its own enthusiastic fans in the area. It’s quite a mix: One group is settled, trying to preserve ties with the past; the other group is settled but still a work in progress, at the center of national debates but likely a major part of the U.S. future no matter what. Both groups have reasons to be proud. 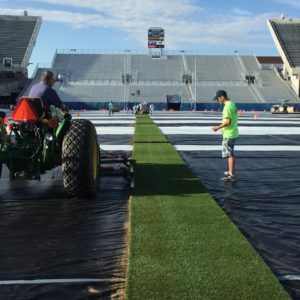 The focus is on the soccer game, but it might be just as much fun to look around the stadium at the two groups, to think about what might happen long after the grass disappears. 2 Comments on "Beyond the Friendly, Two Immigration Stories"
Thank you for another well-researched and fascinating read! How I wish I could make it to Jaialdi, but just can’t manage it this year. It’s been far too long. Again, thank you for the Basque news that I crave!